This software has integrated support for the USB Cartridge Programmer, but can also be used for ISP programming by exporting your workbooks to an ATR image. 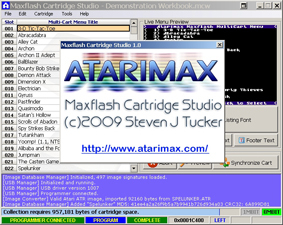 Hi Steve, do you provide a changelog for the Maxflash Studio Software? I just downloaded and installed v2.9 and was wondering how the new Dump > ColecoVision > Start Connection Assistance LED feature works. I have written a ROM generator that generates 127 8K ROM to testing 8MBIT carts. For some reason the Maxflash Studio Software 2.4 and 2.9 detects them to be EXE files instead of 8K ROMs and garbles the contents. I've tried adding "ff ff 00 00 00 00" as the first 6 bytes of the ROM and they seems to mitigate the issue. But it really does looke like the EXE file detection is broken. Somehow the attachment was not uploaded before, Here is the same ROM, once incorrectly found to be an XEX and once correctly found as ROM. Last edited by JAC! on Tue Jun 05, 2018 4:43 pm, edited 1 time in total. Zip and upload your romfile, I can have a look at it. Thanks. was sure I had attached it - but now I am really sure I did . See edited post above. Ah, I have no idea, why I did not saw them last time. When you hold shift while clicking the OK button on adding, the system dialog gives out an extended log. I have send a pm to Steve as well. I had probably selected the file and forgotten the "Add" button. Actually the -fixed file is the one starting with $FF $FF $00 $00 $00 $00. I did that as hack to ensure it is recognized as ROM, because that is clealy not a valid EXE header. The hint with SHIFT shows that the studio find tons of warnings/error when import the plain (-wrong) ROM. Yet it considers it a valid EXE at the end. [Image Database Manager] Initialized, 1245 image signatures loaded. [USB Manager] Initialized and running. [Image Converter] Invalid segment [0xA0A9 - 0x852C] at 0x00000000 -- assuming zero length. [Image Converter] Segment [0x8500 - 0xA981] at 0x00000004 extends past end of file. [Image Converter] Segment discarded, treating as zero length. [Image Converter] Ignoring 2 bytes of extra data at end of file. [Image Converter] Warning: executable sets no RUN or INIT address! Injecting RUN address of 0x8506. [Image Converter] Process completed with 229 warnings and 1 errors. Yes, sorry, that is what I mend. That first checks the extension .rom before analyzing the file. I'm sure he will update his page soon after this post. File extension alone may be misleading. BIN for example is also often used for ROMs. And just yesterday I found out (too late) one .CAR file didn't actually have a header. Auto-detection should only assume EXE if it is an error free segment list till the end. And better not after "Process completed with 229 warnings and 1 errors." And besides that, the menu already offers explicit options. So the easiest would be not to guess at all in case the user explicitly selects the corresponding menu entry. That mosly where the confusion comes from, at least for me. Did you send Steve an email as well ? Just to be sure he reads your message. No, I didn't. Will do that, thanks for the hint. fixes part of the problem. When adding via the "Load 8k ROM from File(s)", it is correctly treated as ROM and not as XEX.